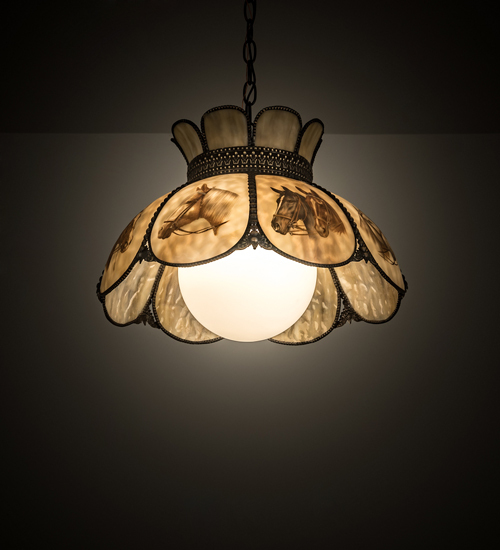 Description: This pendant features Beige and White hand-curved art glass shade enhanced with fused glass images of Horses. Brass filigree accents are hand finished in Craftsman Brown,?highlighted to reveal an eye-catching dimensional look. Hardware is finished in Mahogany Bronze. Overall height ranges from 15 to 50 inches as chain length adjusts in the field to accommodate your lighting application needs. The Quality Bent Glass division of Meyda is over 100 years in the making & still creating timeless masterpieces using tools & methods from the days when we supplied Tiffany Studios. Glass colors & metal finishes are customizable as each Bent Panel fixture is handcrafted to order. Handmade in our 180,000 sq ft manufacturing facility in Yorkville, NY.